“The operator of Japan’s crippled Fukushima nuclear plant is preparing to remove 400 tons of highly irradiated spent fuel from a damaged reactor building, a dangerous operation that has never been attempted before on this scale. Containing radiation equivalent to 14,000 times the amount released in the atomic bomb attack on Hiroshima 68 years ago, more than 1,300 used fuel rod assemblies packed tightly together need to be removed from a building that is vulnerable to collapse, should another large earthquake hit the area. Tokyo Electric Power Co (Tepco) is already in a losing battle to stop radioactive water overflowing from another part of the facility, and experts question whether it will be able to pull off the removal of all the assemblies successfully. “They are going to have difficulty in removing a significant number of the rods,” said Arnie Gundersen, a veteran U.S. nuclear engineer and director of Fairewinds Energy Education, who used to build fuel assemblies. The operation, beginning this November at the plant’s Reactor No. 4, is fraught with danger, including the possibility of a large release of radiation if a fuel assembly breaks, gets stuck or gets too close to an adjacent bundle, said Gundersen and other nuclear experts. That could lead to a worse disaster than the March 2011 nuclear crisis at the Fukushima plant, the world’s most serious since Chernobyl in 1986. Tepco has already removed two unused fuel assemblies from the pool in a test operation last year, but these rods are less dangerous than the spent bundles. Extracting spent fuel is a normal part of operations at a nuclear plant, but safely plucking them from a badly damaged reactor is unprecedented. “To jump to the conclusion that it is going to work just fine for the rest of them is quite a leap of logic,” said Gundersen. The utility says it recognizes the operation will be difficult but believes it can carry it out safely. Nonetheless, Tepco inspires little confidence. Sharply criticized for failing to protect the Fukushima plant against natural disasters, its handling of the crisis since then has also been lambasted. Last week, Prime Minister Shinzo Abe ordered the government to take a more active role in controlling the overflow of radioactive water being flushed over the melted reactors in Units 1, 2 and 3 at the plant. The fuel assemblies are in the cooling pool of the No. 4 reactor, and Tepco has erected a giant steel frame over the top of the building after removing debris left behind by an explosion that rocked the unit during the 2011 disaster. The structure will house the cranes that will carry out the delicate task of extracting fuel assemblies that may be damaged by the quake, the explosion or corrosion from salt water that was poured into the pool when fresh supplies ran out during the crisis. The process will begin in November and Tepco expects to take about a year removing the assemblies, spokesman Yoshikazu Nagai told Reuters by e-mail. It’s just one installment in the decommissioning process for the plant forecast to take about 40 years and cost $11 billion. Each fuel rod assembly weighs about 300 kilograms (660 pounds) and is 4.5 meters (15 feet) long. There are 1,331 of the spent fuel assemblies and a further 202 unused assemblies are also stored in the pool, Nagai said. Almost 550 assemblies had been removed from the reactor core just before the quake and tsunami set off the crisis. These are the most dangerous because they have only been cooling in the pool for two and a half years. “The No. 4 unit was not operating at the time of the accident, so its fuel had been moved to the pool from the reactor, and if you calculate the amount of cesium 137 in the pool, the amount is equivalent to 14,000 Hiroshima atomic bombs,” said Hiroaki Koide, assistant professor at Kyoto University Research Reactor Institute. Spent fuel rods also contain plutonium, one of the most toxic substances in the universe, that gets formed during the later stages of a reactor core’s operation. “There is a risk of an inadvertent criticality if the bundles are distorted and get too close to each other,” Gundersen said. He was referring to an atomic chain reaction that left unchecked could result in a large release of radiation and heat that the fuel pool cooling system isn’t designed to absorb. “The problem with a fuel pool criticality is that you can’t stop it. There are no control rods to control it,” Gundersen said. “The spent fuel pool cooling system is designed only to remove decay heat, not heat from an ongoing nuclear reaction.” The rods are also vulnerable to fire should they be exposed to air, Gundersen said. The fuel assemblies are situated in a 10 meter by 12 meter concrete pool, the base of which is 18 meters above ground level. 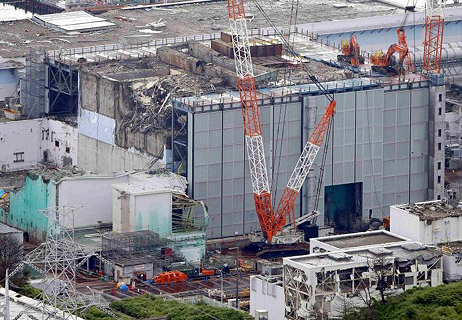 The fuel rods are covered by 7 meters of water, Nagai said. The pool was exposed to the air after an explosion a few days after the quake and tsunami blew off the roof. The cranes and equipment normally used to extract used fuel from the reactor’s core were also destroyed. Tepco has shored up the building, which may have tilted and was bulging after the explosion, a source of global concern that has been raised in the U.S. Congress. The utility says the building can withstand shaking similar to the quake in 2011 and carries out regular structural checks, but the company has a credibility problem. Last month, it admitted that contaminated water was leaking into the Pacific Ocean after months of denial. The fuel assemblies have to be first pulled from the racks they are stored in, then inserted into a heavy steel chamber. This operation takes place under water before the chamber, which shields the radiation pulsating from the rods, can be removed from the pool and lowered to ground level. The chamber is then transported to the plant’s common storage pool in an undamaged building where the assemblies will be stored. Tepco confirmed the Reactor No. 4 fuel pool contains debris during an investigation into the chamber earlier this month. Removing the rods from the pool is a delicate task normally assisted by computers, according to Toshio Kimura, a former Tepco technician, who worked at Fukushima Daiichi for 11 years. “Previously it was a computer-controlled process that memorized the exact locations of the rods down to the millimeter and now they don’t have that. It has to be done manually so there is a high risk that they will drop and break one of the fuel rods,” Kimura said. “I think it’ll probably be longer than they think and they’re probably going to run into some issues,” said Murray Jennex, an associate professor at San Diego State University who is an expert on nuclear containment and worked at the San Onofre nuclear plant in California. “I don’t know if anyone has looked into the experience of Chernobyl, building a concrete sarcophagus, but they don’t seem to last well with all that contamination.” Corrosion from the salt water will have also weakened the building and equipment, he said.